Described by Kodak as one for the ‘adrenaline junkies’ amongst us, on paper the handheld certainly offers some great qualities. 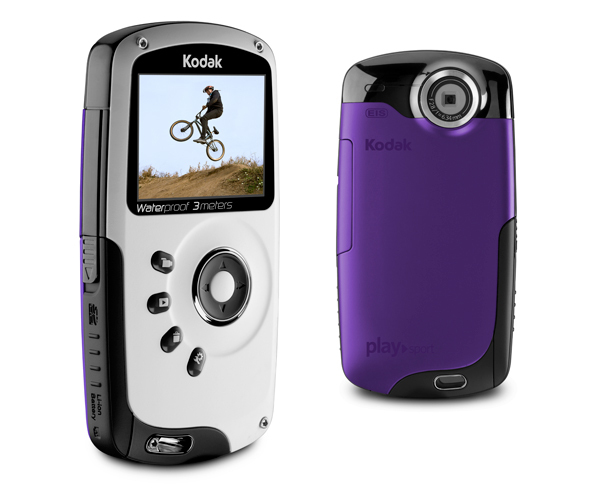 The device boasts 1080p HD recording, 4x digital zoom, image stabilization, water resistant up to 3m (10ft) and 128MB expandable memory. It is also a fun and attractive light weight device coming in a range of colours including purple, black, white and blue. With our love for capturing our favourite moments both in video and photo, this device is the perfect addition to a night out or day at the beach and with its additional durability, it is also one that you would feel safe enough not to get damaged. The camera does have many competitors out there though and many more coming to the table … could a new PlaySport be on the cards for the Christmas shoppers? and share with those unlucky enough to have been captured on the device. Building on that, touch screen would be a cool addition too, possibly with some on board editing to boot and direct internet uploading to say YouTube/Facebook … or maybe I am getting ahead of myself. Regardless, this is a fab little device and one that we have had lots of fun with here … all in all I would give it a very respectable 8/10. The quality of the results is surprisingly good and definitely gets my thumbs up.